Catleaps Gymnastics grew from the work we did in Robert Clack School. 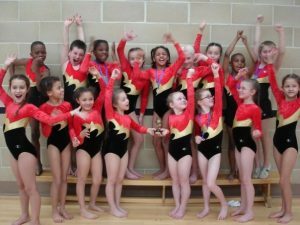 The gymnastics squads at the school ran for eleven years and 2012 saw the gymnasts reach the National Finals for the 10th year in succession. In September 2006 we began our work in Grafton Junior School to ensure that there was a smooth transition from Junior to Secondary School. Since Catleaps began working with Grafton School they have achieved more than ten regional titles spanning the five years we have entered the competitions.